Ii have little to no experience with forums or websites generally, but would like to put a photo or two into my post. How is this done. Can't seem to find any reference to it. Lots of ways of doing this. Firstly are you referring to images that you have on your computer (or device) ? The info that follows in this post is now out of date. 3. 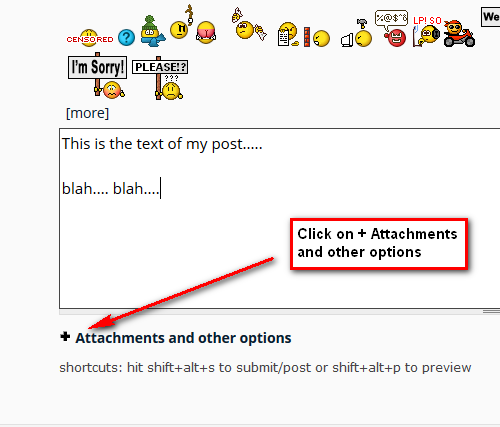 Embed the image but do so from images that you've uploaded to a forum Gallery Album. 1. Firstly compose your post as normal. Note any size restrictions ! If your image is too large then you'll need to reduce it's size first. 4. Once selected the image name will appear to the right of the Browse button. 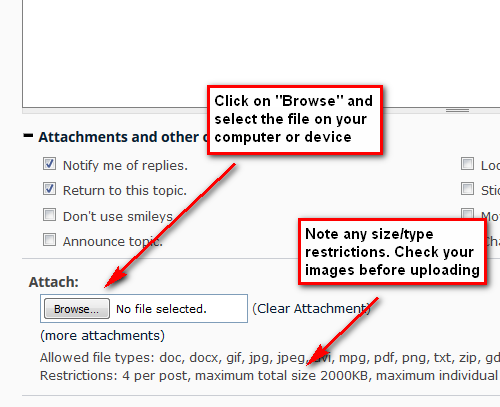 If you have more to upload the click on "more attachments" (again ensuring you are within total size restrictions). When you are finished click on the "Post" button and your image will get uploaded to your post. 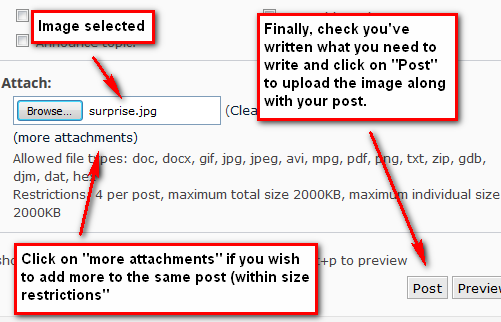 Once you posted the image and check your post you'll see that the image (as an "attachment") appears as a thumbnail. To view it bigger just click on the attachment. As mentioned above I'll do a proper FAQ on this that has all the 3 ways of uploading pics. While flipping through the photos page... is there a means to tell which threads the photos have been posted to? I see various widgets, do-dads and dongles on the photo board and have no idea what they are. Finding the thread they went to would be a benefit. Not easily because many photos are not in posts. 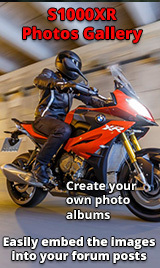 Members also use the Gallery as somewhere to put their pics, they are not neccessarily in posts. All I can suggest is check the members username against the photo in the Gallery, then do a search for that member from the Members list. Once you find the member click on the "Show Posts" link against their profile. You'll then have to go through their postsings.